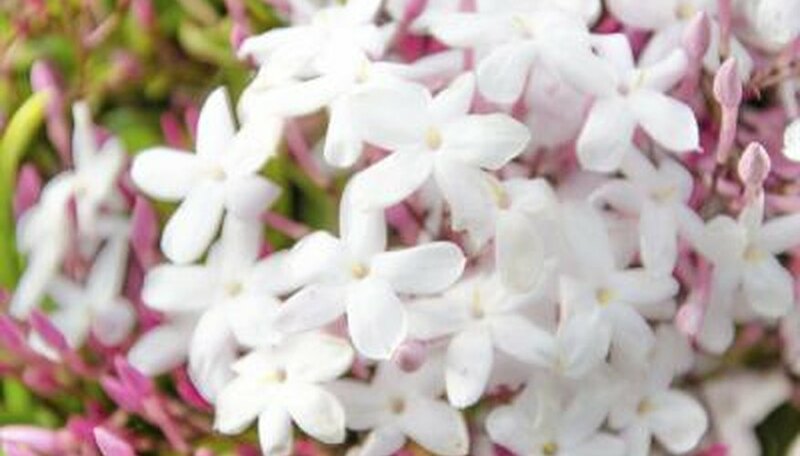 Ease of care adds to the popularity of pink jasmine (Jasminum polyanthum), but fragrance is the plant's main draw. Wafting from an indoor container or bloom-drenched veranda, its scent perfumes the air. Hardy in U.S. Department of Agriculture plant hardiness zones 8 through 11, pink jasmine earned the common names "winter jasmine" and "florist's jasmine" for its dependable, cool-season flowers and simple indoor culture. The straightforward vine is simple to please whether grown indoors or outdoors. Pink jasmine grows best in a full-sun or partial-shade location with sheltered southern exposure. In the warmest climates, protect the plant from intense midday and afternoon sun rays. This Asian native requires well-drained soil, which provides a balance of moisture and oxygen for the roots. Even where climates allow for outdoor planting of pink jasmine, many gardeners choose to keep the plant in containers. A terracotta pot with sufficient bottom drainage holes work well. Pink jasmine grows up to 20 feet in length as its tendrils seek all forms of support. Trellises, arbors, window railings, hanging baskets and decorative pots -- indoors and outside -- can be used to feature the plant and its pink buds and fragrant blooms. When planted in the ground, pink jasmine survives temperature dips to 20 degrees Fahrenheit, but not without damage to its stems. A ground-planted vine stays evergreen in a frost-free climate. Take a container-grown pink jasmine indoors when fall temperatures drop below 50 F to avoid unexpected frost. Indoors or outdoors, cool nighttime temperatures between 33 and 55 F trigger pink jasmine's blooms. Cool temperatures also help the buds open slowly instead of rushing and dropping. The time between full buds and late-winter and early-spring fragrance is about two months. Proper watering and fertilizing are important for a pink jasmine. The plant's soil should be allowed to dry slightly between waterings in the garden or in a pot. If in doubt, test the soil at about a 1-inch depth, and water when it's dry to your sight and touch. Water thoroughly and deeply when you water. Water a container-grown pink jasmine until all of its soil is thoroughly moist and water runs from the pot's bottom drainage holes. Dump extra water from the pot's saucer. Pink jasmine requires fertilizer regularly during the growing season. Mix 1/4 teaspoon of water-soluble, bloom-enhancing fertilizer, such as 7-9-5, with 1 gallon of water, and use the mixture to give the plant a weekly boost in place of a regular watering. Stop feeding your pink jasmine during the winter season as light levels and temperatures drop. Pink jasmine's vigorous growth often calls for serious pruning. Control the vine's size, indoors or outside, by pruning it back to the desired size right after it finishes blooming in late spring. Because pink jasmine flowers on old wood, pruning directly after it finishes flowering leaves plenty of time for new growth and flower buds to form. Use sharp bypass pruners, and sterilize the blades with household disinfectant before and after you prune. Prune lightly in late summer, if needed, and pinch back vine ends throughout the growing season to promote fuller growth. No pruning or pinching should be done once fall officially begins. Instead, let the pink jasmine set its buds. Pink jasmine is susceptible to spider mites, which take up residence on the undersides of leaves. If you shake an affected plant's stems over a piece of white paper, you'll see fallen mites on the paper. One treatment for a spider mite-infested pink jasmine requires mixing 1 1/2 teaspoons of pure neem oil with 1 quart of warm water in a small sprayer. Add one drop of dish-washing liquid to help the solution stick to leaves, and shake the mixture well. Spray the vine until both sides of its leaves are wet. The procedure should be repeated after one week. If the vine is outdoors, spray it on a calm, rather than breezy, day in early morning or late evening. Wear safety eye-wear and gloves when preparing and using the spray solution, and avoid getting it on your skin and clothing. Wash thoroughly with soap and water after handling neem oil and the spray.